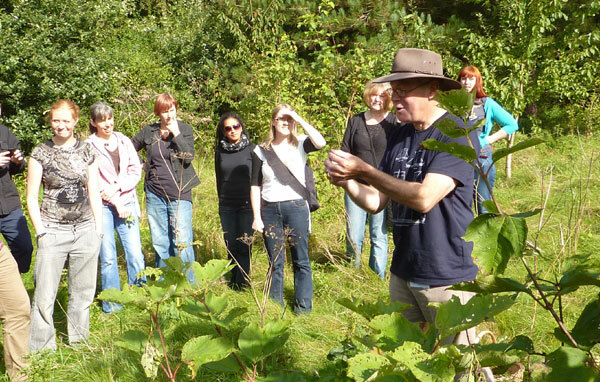 Last week I had the opportunity to join the staff of the Vegetarian Society UK on their team-building day out, learning about foraging for food in the wild, then cooking it. As a trustee (board member) of the society it was great to spend a day in such good company away from all the usual office routines. 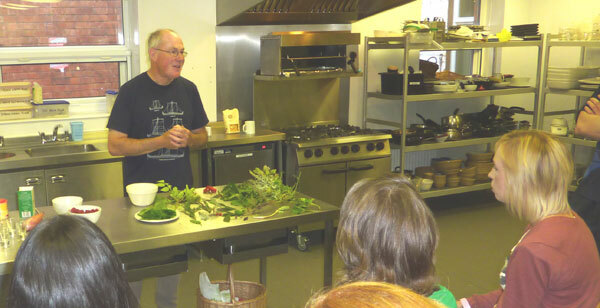 We were led by John Wright, who has appeared in the ‘River Cottage’ TV series alongside Hugh Fearnley-Whittingstall, as an expert on foraging for free food that is growing all around us. The society’s HQ, Parkdale (above) is on the outer edge of greater Manchester – right next door to a large country park with plenty of woodland, so we didn’t have to go very far to find something edible. After a couple of hours collecting unlikely specimens (unfortunately no fungi around), we headed back to the Cordon Vert Cookery School, housed at one end of Parkdale. The school offers professional as well as recreational courses in vegetarian/vegan cookery, and has become world-renowned in its own right for the high quality of tuition it offers. 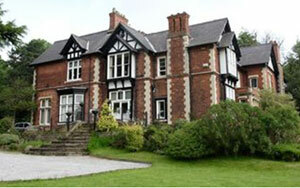 Most recently it has been running courses for the chefs of one of the UK’s top hotel chains. The chefs are not vegetarian of course, but they learn how to produce high quality plant-food dishes. Many of the people ordering these dishes in the hotels are not veg*n either – but it’s a great way to get more people trying more veg food, and raising the quality of what is on offer for committed veg*ns in the process. Living in the country I’ve done some foraging myself over the years, but it does take some dedication as most wild varieties take a lot more work – often for less results – than the bigger, juicier, cultivated plants. My main concern has been that in this cooler northern climate, there is very little wild food, especially fruit, that can be eaten without added sugar to make it palatable. Tropical fruit has rather more sun to sweeten it than we get around here. If you want to try it for yourself, search for ‘Foraging for Food’ on google, and you should find some articles and books for your own country and in your own language.